I’m a couple days behind on blog posts. Last week was super busy for me at work. This week I’m “on vacation” doing house projects. So… I’m gonna fill up some empty blog posts with none other than General Grievous from Star Wars. Spike TV seems to be playing the Star Wars films all the time; which is a great thing. I caught Episode III the other night where Obi Wan takes down Master G. Great stuff. 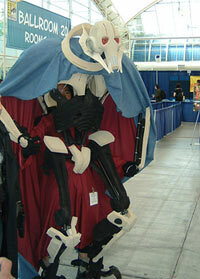 Do a Flickr search for: General Grievous costume. You’ll find some great home-made stuff. Here’s one of the better ones photographed by Soo-Mahn at a masquerade ball. See the man behind the costume peeking through the middle of the costume? Here’s a different angle of the same costume taken by kwc at Comic-Con. And this photo is quite intriguing by janna7. It’s Master G outdoors and the photo is blurred. It has a kind of photojournalistic quality. Here’s an awesome one of Master G walking the floor of ComicCon. It’s pretty sweet cuz Master G looks like he’s ready to rip someone’s head off. I’ve really been enjoying the showings of all the Star Wars movies on cable lately. Agreed… I own most of them on DVD, but I still feel compelled to watch anytime I see them being shown on TV.